With every holiday season, there is a kind of magic in rediscovering old friends, old traditions, old stories. I have only to see the ecstasy on my children’s faces as we unpack our box of Christmas books each December to remember why I go through the trouble of packing them away in January, as opposed to stuffing them into our already stuffed bookshelves. As a parent, it’s magical for me as well: last night my eldest left us at the dinner table, voluntarily bathed himself, got into his PJs, brushed his teeth, and called downstairs, “I’m ready 20 minutes early so I can get some extra Christmas stories!” No wonder they call it the most wonderful time of the year. Just because we only read them for one month a year doesn’t mean I can resist the temptation to add to our collection every single year (there are worse addictions, I’ve assured my husband). Last year was Alison Jay’s exquisite Christmastime, where clues of Christmas carols are embedded into a seek-and-find masterpiece. Previous years’ favorites are mentioned here and here. This year’s acquisitions include two new picture books, utterly different in style, but forever entwined in my mind, since my kids and I had the pleasure of meeting both author/illustrators at Hooray for Books (our fabulous independent bookstore) a few weeks ago. 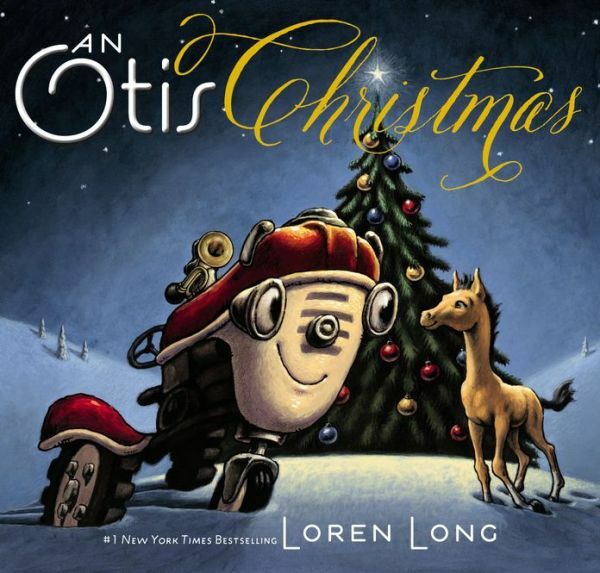 I have twice now (here and here) sung the praises of Loren Long’s books about Otis, the kind tractor who bravely saves the day time and time again on his farm. An Otis Christmas (Ages 3-7) is every bit as endearing as its predecessors, although it has unique bragging rights to a shiny red horn, a newborn foal, and just the subtlest visual parallel to the manger of the First Christmas. 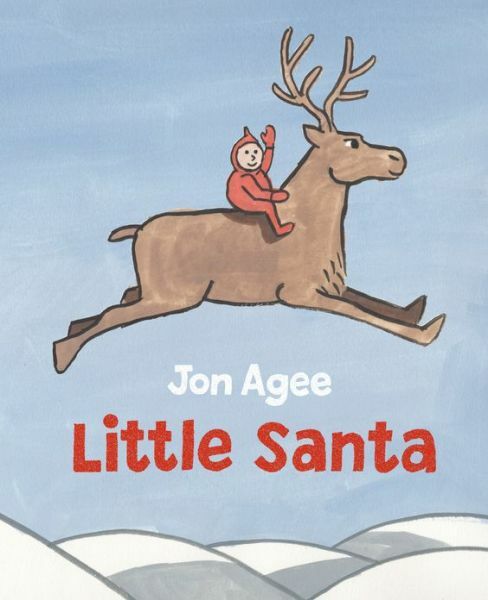 Then there’s Jon Agee’s Little Santa (Ages 3-7), which in contrast to the sweeping drama of Otis, paints a quirky story of Santa’s early days as a red onesie-sporting toddler—and the sequence of events involving a sleigh, a flying reindeer, and an elf partnership, which led to him becoming the Santa Claus we know today. In Agee’s characteristically droll humor, we are introduced to Santa’s parents and siblings (who are bent on trading in their life on the North Pole for the sunny beaches of Florida), as well as Santa’s early penchant for sliding down chimneys (where other children might, say, slide down a slide). In a word, awesome. I’ll admit that, as many times as I’ve attended author events in my professional life, I have never thought to drag my kids along (because “dragging” is exactly what I thought it would feel like to take them down to a bookstore at suppertime on a school night while my husband was out of town). Well, I am here to tell you that you must start doing this, especially with your elementary children. Many of these author/illustrators don’t simply read their books aloud to the audience: they actually draw them right before kids’ eyes. My six year old knows that an author is someone who writes the words to a story, that an illustrator draws the pictures, and that some people do both; but to most kids (and I’m sure to many adults), the entire book-making process feels largely intimidating, inaccessible. These glossy, perfectly colorized illustrations, handsomely bound between hard covers with evenly spaced text around them, feel like something reserved for “real artists” (“I’ll never be a real artist!” I used to cry to my parents every time I couldn’t make my drawings look “perfect”). So here we are at this event with Loren Long and Jon Agee, and my tentative, watchful JP, initially taking a seat in the last row, begins slowly, over the course of the evening, to make his way further and further towards the front, until he is sitting dead smack in front of the easel, on which Jon Agee is seemingly effortlessly and haphazardly sketching with a Sharpie the scenes and characters of his story as he voices aloud the narrative. When Agee doesn’t like something, he simply crosses it out. Or he draws on top of it. Sometimes all he draws is a single line (to indicate how high the snow was); sometimes he draws five or six scenes on the same page. No fuss, no special tools. Just sheet after sheet of flimsy newsprint and a blue (sometimes red) marker. Emily was amused simply to hear the stories. But for JP, watching these author/illustrators create before his eyes was positively Mind Blowing. And don’t think he didn’t come home and go straight for his markers. 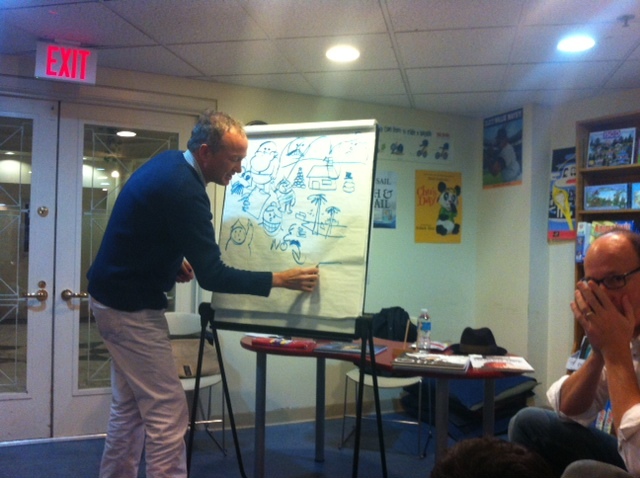 Jon Agee madly sketching from “Little Santa” (wow, was he fast) with Loren Long making sound effects in the background. Such fun! Jon Agee gave us an additional gift that day. You see, as excited as I was for the publication of Little Santa, I also knew that, as a parent who gets easily tripped up in discussing the topic of Santa Claus, I would have to confront the inevitable question: “How does that guy know that this is what really happened when Santa was a kid?” Sure enough, a child asked this very question, and Agee’s reply was absolutely perfect: “I actually don’t know for sure. Before I wrote the book, I did a lot of research. I went out and talked to lots of people, many of them kids, and I asked each of them what Santa might have been like as a kid. And a lot of people said some pretty similar things, like that he must have always lived in the North Pole and liked to slide down chimneys. But, at the end of the day, this is just one story. One version of what might have happened. My version.” Christmas, after all, is as much a time for storytelling as it is a time for believing. At the end of the day, the stories we tell make the real magic. You are currently browsing entries tagged with Christmas at What to Read to Your Kids.